1. 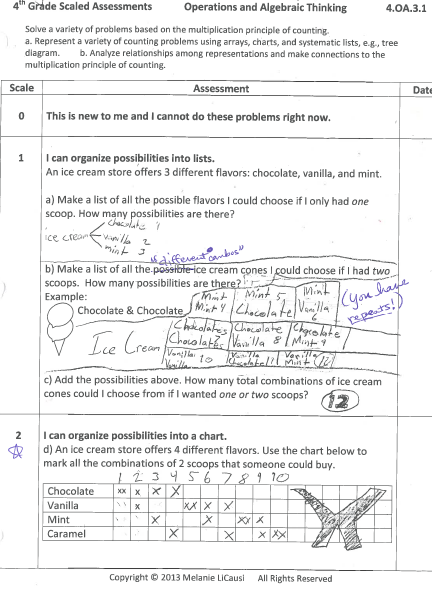 How do I use Assessments with Learning Goals and Scales? These assessments are written with scales embedded in them. If you’re familiar with Marzano’s presentation of a scale, he suggests a meaning for each one. Scale 1 designates a very beginning level of exposure to a skill or concept. Scale 2 represents someone who is still working on mastering a concept, but has some basics down. Scale 3 shows mastery of grade-level expectations, and Scale 4 could be either an advanced knowledge, in-depth explanations, or an ability to apply the knowledge to more complex situations. Most of these Assessments have been created to point out the related content from earlier grade levels. Because the test allows for prior knowledge to be established the first step is the Pretest. Each student should complete the test for one math standard in one sitting, doing as much as they can independently. Then the test is corrected and scored. The first score is not for grading purposes. It is only to give you a starting place for planning and differentiation; and the student some acknowledgement for what they already know. The first score simply tells you how many scales (sections) the student has mastered. They don’t necessarily need to have 100% correct to “pass” a section. It’s up to the teacher, who knows the child, to decide what passing looks like. Scoring them can be tricky if you have a child who masters scale 2, but not scale 1, like the student above. I would have him color in the scale 2 box, but not the scale 1 box on his Portfolio sheet. After the students receive their scores they can look them over and record them on their Student Portfolio sheets. The sheets provide a brief statement of each standard, coloring boxes for each scale, and a goal setting space on the back. You can decide whether or not you have time to write goals and reflections, but it does help the students become more conscious of what they’re doing well in, or need to be more attentive to. I had my students keep all of their Portfolio pages in a binder, and we would add each test as it was completed. The Portfolio pages are created to be binder dividers for each cluster of math standards. On the back side of the Portfolio page, the student above could think about what he found difficult about scale 1, and write one sentence about what he would like to learn. He might set a goal to be able to do these kinds of problems in the next few weeks, or to pay extra attention to problems like this in class. She might set a goal to ask more questions or practice these problems more. After the pretest students can be grouped for instruction and differentiation. I like to use color-coded spreadsheets for easy sorting. You can find some FREE ones pre-formatted with color-coding and links to the Common Core standards for quick reference. 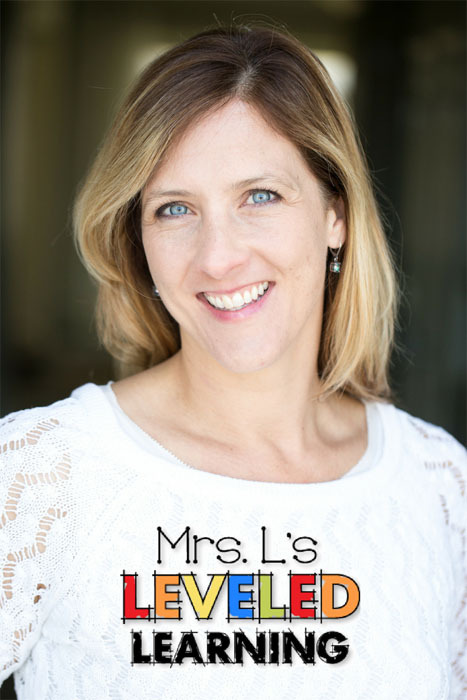 Visit Mrs. L’s Leveled Learning Store and click on your grade level in the Custom Categories tab, or scroll though the list of products. The sets of Student Portfolio pages are also FREE and can be found here. The teacher decides when students have been given ample time to learn the content from each standard, and then the same exact test is given again as a Post-test. I waited anywhere from 2-4 weeks to give the post-test. Students should be given as much time as they need to complete the entire test. Depending on your students, you may or may not require all of them to complete scale 4. This is also the time when your students have the opportunity to complete and correct any mistakes they made on the pretest. Students will pick up right where they left off. Since some have a lot to learn, and others don’t, it’s good to plan a silent activity for individuals who finish early. The post-test is scored and graded this time. Here is a suggested grading scale. An explanation of the grading scale is given under the “Grading” tab. After the post-test is graded, students can go back and color in more of their scales to show what they’ve mastered. They may also revisit their goals to record whether they “reached [their] goal,” “made progress,” or are “… still working on this.” Giving some reasons may also help students become more aware of their learning. These Assessments and Student Portfolio binders are excellent for parent conferences and administrator evaluations! I found that I didn’t have to spend as much time explaining what we were doing in math class. Each child’s progress is so clearly and simply documented. 2. How do I score students on the pretest if they get some right, but not in every scale? The pretest may show a student’s knowledge to be very scattered. They know bits and pieces about a topic, but can’t get most of the problems right in each scale. It may be that a student cannot claim any scale as prior knowledge on the pretest. That’s okay. The point of scales is for students to see growth, and some of them may be starting from scratch. They will have more of a reason to be proud of themselves when it’s time for the post-test, and they can see their growth! In my own classes, I ran into a few situations where a student would show mastery of scale 2, but not scale 1 for instance. That doesn’t make sense, I thought, How do I score them now? In these situations, I would allow a student to color the exact scales they mastered (scale 2), and leave earlier ones blank (scale 1) until they could complete them accurately. Sometimes it’s explanations or vocabulary that get kids stuck, even if they know how to perform an operation. Sometimes they were taught things a certain way by someone else, but it was incomplete. As long as their knowledge is accurately acknowledged, it doesn’t really have to be explained, just learned! There are student examples of work under most of the grade-level page tabs on this site if you’d like to see some specific examples.